Thanks for that Smiffy - I'll look into it further. On the map those cottages are called Haine Farm Cottages. 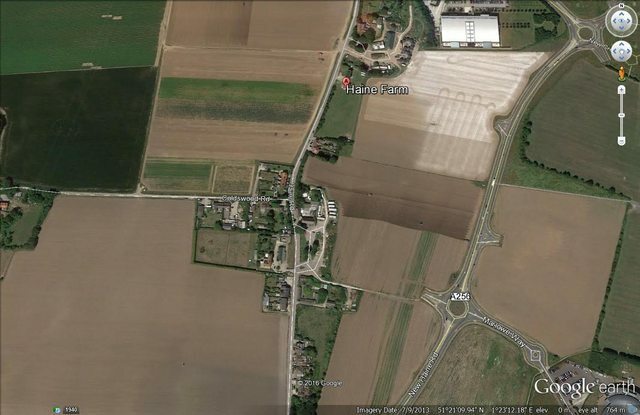 Strangely, Haine Farm is shown some way further north (to the right of your photo). Haine Cottage is farther south (to the left) near the roundabout and looks like it may not be the original building, although it occupies the same plot. With Conan's help, I've now found a row of 4 cottages named Haine Cottages. Would be interested to know where the one just called Haine Cottage is. Have had a quick search but not located it yet. There's a Haine Cottage, singular, just south of Haine. No Haine Cottages though. That all fits. My relation's spouse was a farm worker in 1901 so Haine Cottages could well be associated with Haine Farm. That gives me a good pointer. A bit of a long shot. Does anyone know where Haine Cottages, St Lawrence Extra are/were exactly? They are listed in the 1901 census.